With the Blue Star Programme 2015/2016 now drawing to a close, we wanted to give you one last update this year of the many goings on. Thanks to the Blue Star teachers, this year’s Programme was another great success! Now in its fifth year, the popularity of the Programme continues to grow, with over 180 schools taking part this year alone, from every county in Ireland. Many thanks to all of you who have submitted your Blue Star Final Reports. We were very impressed by the brilliant work you and the pupils have been doing throughout the year. We greatly enjoyed reading about it and looking at the colourful photos you included! It was also very helpful to read your feedback on the Blue Star Programme and we will try our best to incorporate it as the Programme continues. As you know, submitting the Final Report is required for you to officially complete the Programme and attain your Certificates of Achievement. Here in the office, we have been busy packing up the Certificates, ready to send around the country! 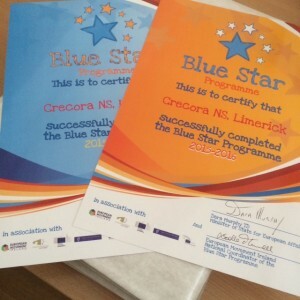 For those of you who have submitted your Final Report, your official Blue Star Certificates of Achievement – signed by the Minister of State for European Affairs, Dara Murphy TD, and Executive Director of European Movement Ireland, the National Implementation of the Blue Star Programme, Noelle O Connell, as you can see in the photo – are on the way and should be with you soon, and certainly before the end of the school year. For the few of you who haven’t yet submitted your Final Report, please do as soon as you can so we can get your Certificates out to you. The deadline for submission was 20 May, however late submissions can still be emailed to bluestar@europeanmovement.ie or bluestarprogramme2016@gmail.com (which is the alternative email address we created only for Final Report submission due to the large size of the files). Here is the link to the document you will need: www.bluestarprogramme.ie/resources. If you have any questions, please get in touch with us here in the office and we’ll be more than happy to help you in any way that we can. On Europe Day, 9 May, we were joined in Dublin City Hall by Gardiner Street Primary School from Dublin and St Thomas National School from Rathmore in Westmeath. 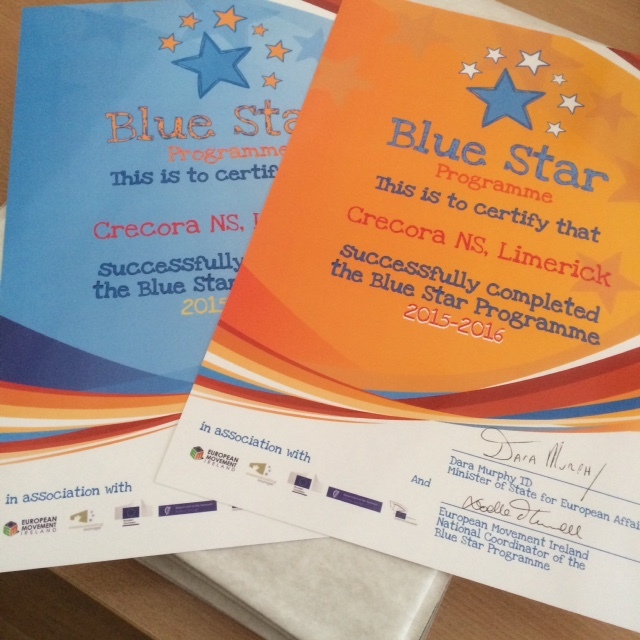 Both schools have completed all five years of the Blue Star Programme, so congratulations to them! To mark the occasion, we were also joined by Deputy Lord Mayor of Dublin, Councillor Janice Boylan, and Minister for European Affairs, the EU Digital Single Market and Data Protection, Dara Murphy TD, who made a special presentation to each school. Together with pupils from both schools and European Movement Ireland’s Executive Director, Noelle O Connell, Councillor Boylan and Minister Murphy formed a ‘Handshake for Europe’ as you can see below to celebrate Europe and symbolise the solidarity and diversity between them as EU citizens. We all had a great day and the event was covered as part of RTE’s News2Day programme. Thanks again to Gardiner Street Primary School and St Thomas National School for being involved and for all their hard work over the past five years. We were also delighted that so many of you got in touch to tell us about the other wonderful celebrations and ‘Handshakes for Europe’ which took place in schools throughout the country to mark Europe Day. We do hope that the pupils enjoyed the opportunity to showcase their hard work as part of the Blue Star Programme and we would like to thank the schools and teachers for organising such events. We would also like to thank all the MEPs, Ambassadors and TDs who visited Blue Star schools on Europe Day and on other days throughout the year. We have consistently gotten good feedback from the visits, with the VIPs often telling us how impressed they are by the pupils’ work and knowledge. Well done to the schools and teachers for organising the visits and, as always, we would love to see any photos you may have from them. Finally, a big thank-you and congratulations once again to all of the schools who have participated in the Blue Star Programme this year. We were delighted to have the highest number of participating schools yet and to receive such positive feedback about the Programme. Looking ahead, registration for the Blue Star Programme 2016/2017 will open on the www.bluestarprogramme.ie website around the start of the next school year. For those teachers interested in taking part, please email bluestar@europeanmovement.ie with your details and we will contact you at that time. We hope to see many of you registering again next year and please do spread the word! If you would like any more information on the topics above or any other aspect of the Blue Star Programme, feel free to get in contact with us and we’ll be more than happy to advise you. Otherwise, thanks again and have a great summer!